I’m an active feminist and a casual NASA fan, but up until I watched the fifth episode of The Astronaut Wives Club I had never heard of FLATs. The term stands for First Lady Astronaut Trainees and it refers to a group of real-life female pilots who had dreams of becoming astronauts back in the early 1960s. Through a privately funded program, 20 fearless women volunteered to undergo the same rigorous physical and psychological testing that had been conducted on the Mercury 7 candidates. They swallowed 3 feet of rubber hose, had ice water shot into their ears, were pushed to exhaustion on stationary bicycles, and had electric shocks sent into their arms. Thirteen of the women passed every single test—sometimes with better results than the men—and proved they were ready, willing, and able to train for space. The U.S. government, however, disagreed. Frustration is a key emotion I felt during “Flashpoint,” but for once I was experiencing it with, not at, this imperfect ABC miniseries about the early days of NASA’s space program as experienced by the wives of the Mercury 7 astronauts. The episode acutely captures how maddening sexism is and how deeply it’s intertwined with history. None of the FLATs ever got to be astronauts. The first American woman wouldn’t travel to space for another 20 years. The immensely compelling story speaks both to the bravery of trailblazing women and to the cultural attitudes of 1960s America. So why hasn’t it been told before? Our historical fiction tends to focus on the people who made great achievements. We like winners, not losers. But the problem is that for most of Western history, the “winners” were almost exclusively white men. In order for our fiction to capture the true diversity of the human experience, we need to change our assumption about the kind of source material that makes interesting stories. After all, this FLATs plotline—though it ultimately centers on a bunch of historical “losers”—was one of the best parts of The Astronaut Wives Club. It’s explored through the lens of Trudy Cooper (Odette Annable), a progressive astrowife. She’s a pilot who’s willing to maintain a sham marriage with her cheating husband Gordo just to be near NASA’s work on manned space flight. So when her old friend Dot Bingham (Mercedes Mason) shows up with news of the FLATs program and the upcoming hearing before a congressional subcommittee about whether it can continue, Trudy throws herself into the cause. As with most of its storytelling, The Astronaut Wives Club plays fast and loose with the details of history but mostly gets the spirit of the thing right. In real life several members of the FLATs (otherwise known as the “Mercury 13”) did testify in front of a subcommittee, but none of them were friends with Trudy. Instead, Dot is a fictional character designed to bring Trudy directly into the story. It’s a smart narrative choice if a dubious historical one. 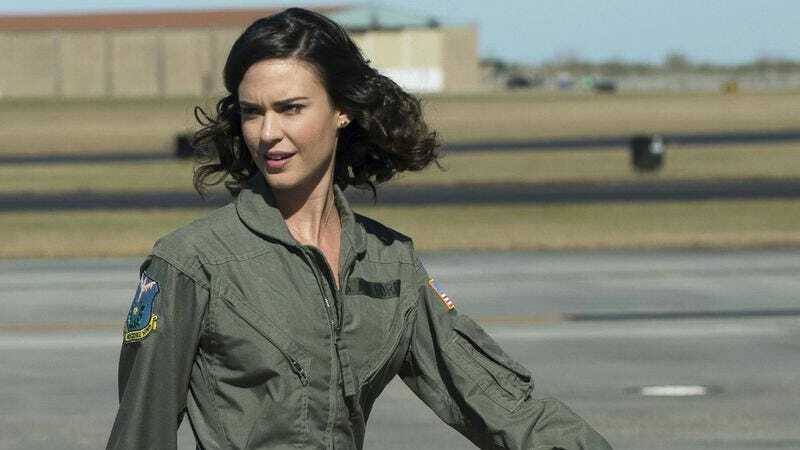 As played by Annable, Trudy is one of the more engaging characters on the series and one we’ve been rooting for since she first shared her dreams of seeing a woman in space in the show’s premiere episode. In “Flashpoint,” Trudy’s optimism is infectious. She explains that John Glenn and Scott Carpenter—the astronauts asked to speak at the hearing—are “two of the most open-minded guys in Mercury.” If she makes her case rationally, she’s confidant she can get them on her side. Through Dot—a stand in for real-life pilot Jerrie Cobb—the show voices arguments for why women are actually more physically fit to be astronauts: They’re smaller and consume fewer calories than men, which means they can move around more easily in the capsules and require a smaller food supply (less food=less weight=less cost). Plus they’re less likely to have heart attacks and are better at withstanding monotony, loneliness, and pain. As played out on the show, the hearing is refreshingly free of the simplistic sexism that so often pops up in stories like this. The congressmen aren’t leering bigots who think women belong in the kitchen. In fact, they’re genuinely interested in what Dot has to say. Sure, their insistence that women are necessary for makin’ babies on space colonies is a little patronizing, but it’s also an indication that there’s hope for the FLATs program. The idea that even “good guys” are affected by societal biases isn’t one that comes up enough in historical fiction. We prefer to imagine our heroes as somehow above the prejudices of their time. Interestingly, that’s precisely how the show is dealing with its depiction of race relations. But “Flashpoint” correctly identifies that sexist barriers aren’t solely erected by villainous misogynists. More often than not they come from ambivalent moderates with their own agendas. As Trudy sees it, John and Scott aren’t particularly worried about women being astronauts, but they are worried about opening the door for other civilian pilots to steal their jobs. Even though NASA had relaxed qualifications before (John Glenn didn’t have the required engineering degree), the negative testimony from two Mercury 7 heroes means the subcommittee remains sympathetic but unmoved. “I’m sorry, Trudy,” Scott mumbles when she confronts him after the hearing. “Apologize to your daughters,” she commands. It’s a moment that could feel trite were it not so earned and so well delivered by Annable. With her own daughters, however, Trudy takes a more hopeful approach. “All the smart things [Dot] said got written down,” she explains, “And now they’re a part of history.” It’s bittersweet—perhaps unintentionally so—that this show is one of the few places that has really brought that history to light. The FLATs plotline ends with a small victory: Trudy’s overjoyed at news that Russian cosmonaut Valentina Tereshkova has become the first woman in space, shattering Gordo’s orbital record in the process. For a brief moment, her allegiance to womankind trumps the nationalistic or familial ties she’s supposed to feel. It’s a beautiful moment of global female solidarity. At its best, The Astronaut Wives Club makes the revolutionary argument that it’s worth exploring women’s stories even when they’re made up of only small failures and small victories. Objectively, the show’s seven protagonists contributed less to history than their husbands. But that doesn’t mean their stories aren’t dramatically interesting or that they don’t deserve to be told, too. The fact that The Astronaut Wives Club doesn’t always do the most compelling job of presenting this history is a pity. The idea of centering a show on these women is not. If The Astronaut Wives Club isn’t exactly making one giant leap forward, its female-focused exploration of history is at least one small step in the right direction.